Becoming the person I always was inside. PromptPieces - a twitter game for writers. No two writers, given the same writing prompt, will write the same story. Here we have our writing prompt list. All writing prompts on this list were submitted through the Twitter game #PromptPieces. (I have to give it to Samantha the Writer, that’s a great hashtag!) 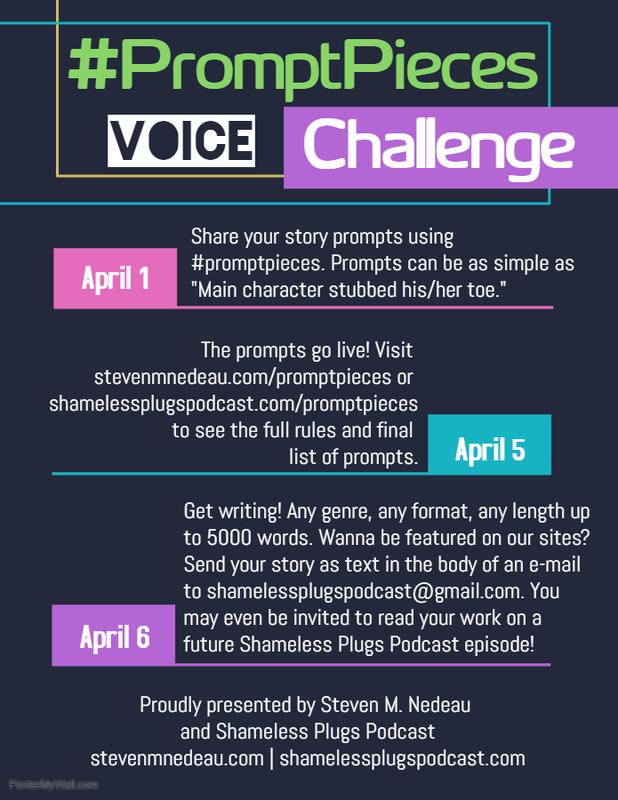 Ten of the writing prompts submitted will be randomly selected by a number generator to create a story framework. And as the stories come in we will be placing them here…well, not here, but right below here at the page that opens when you hit the big button. Take eight of the ten writing prompts and place them in any order you like to create a story. Write the story and send the text in the body of an email to shamelessplugspodcast@gmail.com. Your story can be mystery, fantasy, science fiction, crime drama, poetry, limerick…. The point is that the format doesn’t really matter. What matters is that we are all going to take the same framework and we will all create something entirely different out of it. When we’re finished, we’ll record some of the stories to be read on upcoming Shameless Plugs Podcast Episodes. We’ll also place as many stories as we can fit here so that you can read what others have done with the same starting framework. April 5, 2019 - collection of writing prompts has ended. Check the web-pages stevenmnedeau.com/promptpieces (you’re here now) or shamelessplugspodcast.com/promptpieces for the list of prompts. Put them in any order you want and start writing! April 6-19, 2019 - I hope you’re finished. Send your work to us (as a text in the body of an email) and we’ll post it here and at the Shameless Plugs Podcast website. You can send them sooner if you finish before this date. Here they are, the selected writing prompts! Pick 8, put them in any order you desire and write a 5,000 words or less short story, poem, play, limerick, or song. These are not my pants. There's a strange woman at the window. Hero finds a bloody knife in significant other's home. Hero's significant other is missing. He pulled the sword free, then dropped it as it screamed in pain. The door opens on the last person you want to see. My accordion isn't possessed. It always sounds like that. character wakes bound, gagged & with enemy looking at them holding a knife/dagger. In association with Shameless Plugs Podcast.